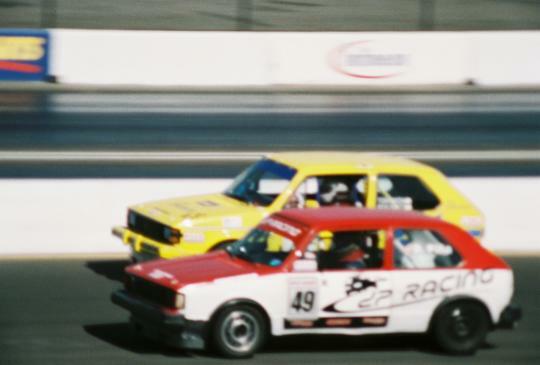 The next race of the 2005 season found Shed Racing at NASA's October 8-9 event at Sears Point International Raceway, in the GTI Cup class. There were 6 cars in class this weekend, with Ron Swett picking up the driving duties Saturday, and Tom Aiken driving Sunday. Other competitors included Joe Craven, Scott Neville, Calvin Wan, Carlos Suarez, and Dan Piña. Calvin was driving Dan's car, and Dan was driving David Piña's car. David had planned on racing, but was unable to due to a paperwork problem that he wasn't able to sort out in time for the race. Changes to the race car for this event included more agressive rear alignment settings, and removal of the front sway bar to try and limit wheel spin coming out of slower corners, a problem at Sears Point. A light system was also added to the dash for the benefit of the video camera, as a poor-man's data acquisition system. When the throttle is fully open, a green light comes on, when the brakes are used, a red light. The first session of the day, Ron got off to an shaky start. Cold tires, a cold track and the alignment changes caught him by surprise, and he spun in the esses on his out lap, flat spotting the right front tire. He had to put up with the vibration from the tire for the rest of the session, but he managed to get his lap time down to a 2:10.74. Dan was the fastest in the morning session, with a 2:03.57. In the qualifying session, Ron improved with each lap, dropping his lap time to 2:06.9. Dan Piña was on fire grabbing the pole with a time of 2:02.941. Right behind him was fast Joe Craven at 2:03.050, followed by Scott Neville at 2:03.74, Carlos Suarez, 2:04.1, and Calvin Wan, 2:05.85. Ron wound up sixth on the grid. Dan and Joe pass an RX7 at the start of Saturday's race. 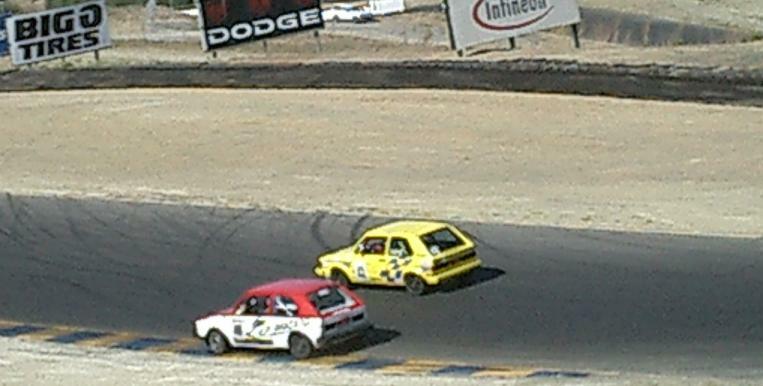 The race started well, with Dan passing an RX7 on the start, and led the GTI field for most of the first lap. 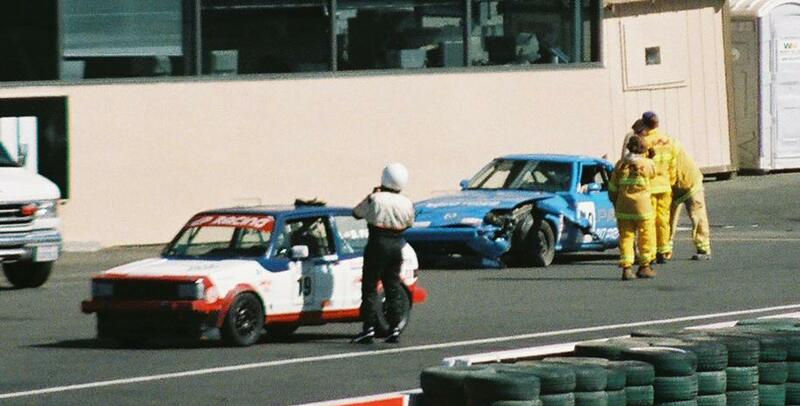 When Dan was coming out of the esses, A RX7 went off the track to the left exiting Turn 8A, and spun back onto the track, contacting Dan fairly hard on the driver's side front wheel in turn 9. The Mazda continued to spin, with his right rear hitting Dan's left rear. The Mazda continued off the track to the right, into the tires, ending his day. When Dan was nearing Turn 11, he noticed two other RX7s coming up behind him way too hot. He heard skidding tires and he stayed wide, which was a good move, as one of the Mazdas slid by him on the inside, sideways, into the tire wall. At this point, Dan tried to donwshift, and learned as a result of the contact with the RX7, the suspension was damaged, pushing the drive axle into the transmission, keeping him from shifting gears. Dan pulled his crippled car off the track and sat out the remainder of the race. Dan and Kurt Frietzsche sit out the race by the drag strip. Ron and Calvin had a great battle for fifth place most of the race, swapping positions several times. Ron had opened a decent gap over Calvin in lap 8 when Calvin's car started smoking a bit coming up the front straight, and then smoking badly as the engine blew up just before turn 1. Calvin wisely got off the racing line and parked the car in a safe spot to sit out the remainder of the race. Joe Cravin finished first, followed closely by Carlos, only 1.2 seconds behind. Scott Neville finished third, followed by Ron. Best lap times of the race were Joe 2:02.1, Carlos 2:03.0, Scott 2:03.3, Ron 2:05.9, and Calvin 2:06.0 before his engine expired. Ron and Calvin battle for position. Calvin gets a ride back to the paddock. After the race, David, Dan and Calvin went to work on the front suspension of the #19 car, and with the replacement of the lower A-arm and axle, got the car race worthy again. Unfortunately the #49 car was terminal, with a twisted connecting rod poking out a roughly 3 inch square hole in the block. The engine failure was severe enough that debris from the engine hit the fuel tank and caused a leak. 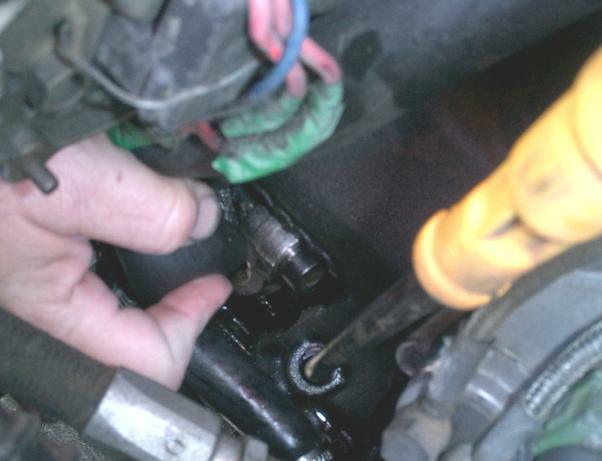 The silver thing is a connecting rod and wrist pin, seen through a big hole in the block. Tom awoke Sunday to find himself 38 years old. He got to a slightly better start than Ron in Sunday's warmup, he didn't go off until his second lap. He carried a little too much speed into the esses, and when it was clear he wouldn't make the corner, he went off straight to the inside of the track before turn 8A. Once it was clear, he reentered the track in turn 9, and continued with an uneventful session. Tom's best time was 2:10.01. Carlos was fastest, with a 2:05.4, followed by Joe with a 2:05.6 and Calvin, who took over the #19 car with a 2:06.7. Scott skipped the morning warmup The session was ended early when two idiots in Factory Five cobras tried to go three wide passing Joe in turn 9, and ended up trying to move a concrete wall, with predictable results. Tom was faster in the qualifying session, with a 2:07.4 Joe Craven took the pole with a 2:02.6, followed by Carlos with a 2:03.7, Calvin with a 2:03.9 and Scott with 2:04.1. To try and avoid conflicting with other groups, the GTIs opted to start behind the Spec Miata class, the last group on the grid. The idea was to try and let each group run their own race, without interfering with each other. Unfortunately a SU class Porsche and an Audi World Challenge car chose to start at the back of the grid, and managed to get in the middle of the GTI race for the first lap. The race start was clean, with Tom doing his best to try and keep up with the faster rabbits, but gave up momentum when the Porsche and Audi passed off line. He kept at it, passing a backmarker Spec Miata, and a Pro-Sedan MR2. In the fifth lap, Tom passed Scott Neville who was off the track outside turn 7. 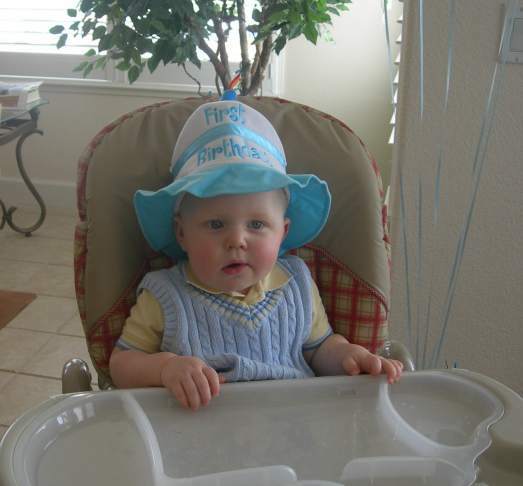 Scott had a transmission problem, and his car was stuck in third gear. He managed to limp back to the paddock without incident. Joe won the race, followed closely by Carlos, then Calvin and Tom. Carlos had the fastest lap of the race, with a 2:02.63, followed by Joe with a 2:02.64, Calvin with 2:03.6 and Tom with a 2:07.38. Scott ran a 2:03.7 before he retired. Tom takes the checkered flag in Sunday's race. When Tom and Ron returned to Ron's house to unload, they found Shannon, Cindy, Jessica, Jason and Catherine ready with dinner and birthday cupcakes to celebrate Tom's birthday. Tired, sunburnt birthday boy helps with the candle. Note the dash lights for full throttle and brake. 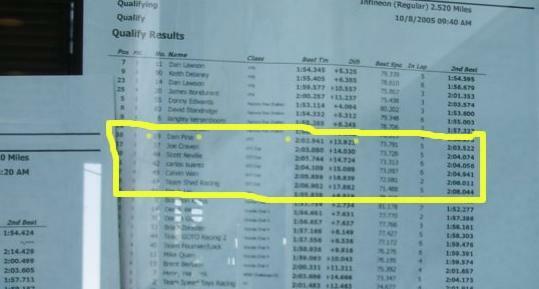 Also note that the full throttle light fails halfway through Tom's best lap.